A careful listening to your needs, ONEUW's know-how, the solution. A power suitable for wide angle photos, even backlit or the most technical macro, without any need to increase ISO on your digital cameras. A high-quality light without any compromise, with a wide, uniform coverage and a slightly warm color temperature. A modern, highly efficient electronics, versatile in use, with sync cable and fiber-optics cable connections, supported by onboard TTL digital protocols. A project and a realization entirely Made in Italy. Years of research, development, and testing allow us to offer you state-of-the-art electronics. This operating mode allows us to get very accurate exposure of the flash without the aid or interposition of any converter. In addition to the protocols managed with a sync cable, the s-TTL mode is also supported with signal transmission by an optical fiber. The selected component with strict quality parameters and an intelligent management of all the operational functions of the strobe ensure a very high level of reliability. A realization with no compromises, robustness, precision, and finish at levels of excellence. The body is made from a solid block of aluminum alloy machined with ultra-modern multi-axis CNC machining centers. The aluminum is surface treated and protected by a hard anodic oxidation with nanotech quartz coating which makes surface hydrophobic. The robustness of the realization allows the use of strobe in all technical dives, hyperbaric tests are performed at pressures equivalent to 200 meters in depth. To obtain these results, ONEUW has designed the layout of the controls simplifying and rationalizing their functionality: no buttons, no switches, just two large lever selectors, a multifunction rotary control switch and a large, easily readable control display. The red MAIN lever selector on the left operates the control of the pilot light (in the two available powers) and the TTL flash reading mode, both with a sync cable and fiber-optic cable connections. The black INPUT lever selector on the right allows us to select input and connection mode that ONEUW intends to use: sync cable socket, fiber-optic cable socket, optical receiver on the reflector for slave mode. The control lamps indicate the selected SYN-OPT-SLV input. The power control is delegated to the central rotary control switch, which operates an encoder. In manual mode the adjustment will take place at ½ f-stop increments over a range of – 6, while if the TTL mode is selected, the control function will be dedicated to exposure compensation at ⅓ f-stop increments over a range of +/- 2. The selected setting for power or exposure compensation is clearly visible in the center section of the large display. A high-quality light from the outset, a wide coverage angle, an evenly distributed power and a slightly warm color temperature: these are the guiding parameters that ONEUW has followed in designing, in shaping ONEUW's light. ONEUW also paid great attention to the design and surface treatment of the parabolic reflector, which combined with a spherical dome port allowed us to obtain an optical design with excellent performance. The dedicated desktop battery charger allows fast recharging in less than two hours. The control of the remaining charge is visible on the display every time the flash is turned on and off. 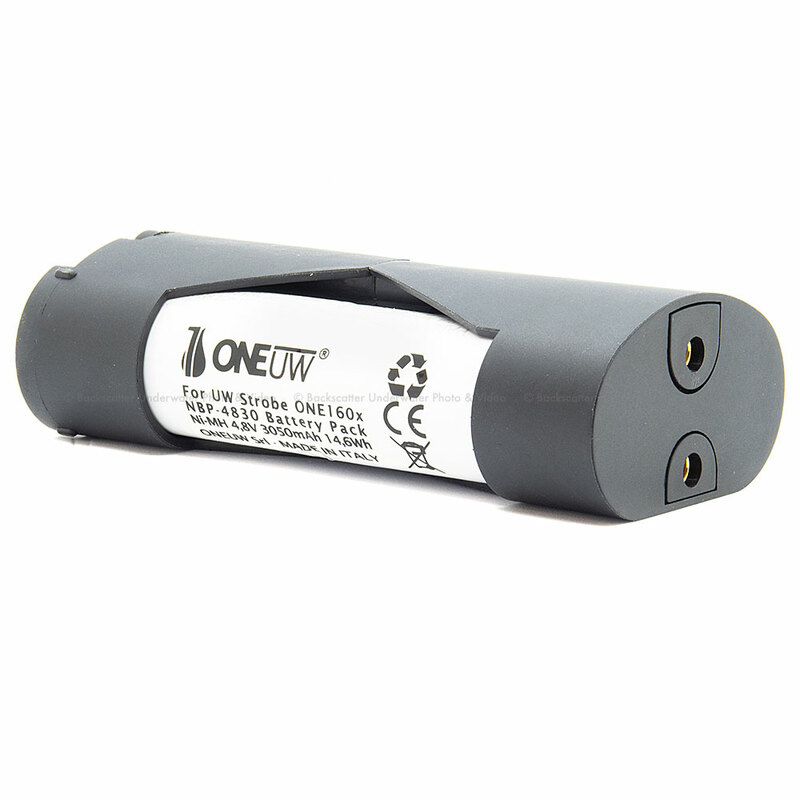 ONEUW has paid the utmost attention to safety, providing the battery pack with a short-circuit protection, making the battery compartment watertight and equipping the closing cap of the compartment with a safety valve. The strobe is equipped with both S6 type sync cable socket and Sea&Sea type fiber-optic cable socket. The connections arranged in a line on the body back make it easier to operate on the main controls and protect the cables from the stress of accentuated bending, thanks to their natural orientation. A perfect dialogue between camera and strobe. To ensure optimum data transmission between the d-SRLs and ONEUW's strobe, ONEUW has commissioned, based on ONEUW's technical specifications, a sync electric cable with high-quality multi-wire conductors and special outer coatings that are particularly flexible and resistant to use in the marine environment. All connector components are designed and manufactured in aluminum with hard anodizing treatment or molded with the best technical polymers. The connections available in ONEUW's system are the classic NikonosV and the very reliable S6. A series of accessories for light shaping, diffusers, and snoots are currently in production.